Since jewelry is such a personal statement, I prefer to create designs that are versatile and adaptable. What might match my mood one day might not be suitable the next day. For that reason, each of my pendants and necklaces are interchangeable and sold separately. I am continually amazed at how different a pendant can look just by changing the necklace from which it hangs! Every one of my crocheted bead necklaces are hand crocheted using up to 1200 glass seed beads per necklace. All of the seed beads are strung on a single length of crochet thread first and then the crocheting begins! There are 3 lengths of crocheted bead necklaces available with the choker style necklace being adjustable in length. Crocheted bead necklaces can be worn without any further adornment or with a Shugie’s pendant. For those of us that are having a little difficulty with lobster claw clasps… All of Shugie’s crocheted bead necklaces come with an S style clasp. This eliminates trying to open that tiny lobster claw clasp behind your head or finding someone to help you put on your jewelry! Simply slide one half of the S through the attached ring. No need to squeeze the S shut, the necklace stays on due to the draping effect around your neck. Each one of my pendants seems to tell its own story. I use natural stone, glass or polished, dyed shells to create my pendants. Due to the variations in raw materials, every pendant is unique and distinctive. All of my pendants will slide on my crocheted bead necklaces making them extremely versatile and easy to change. 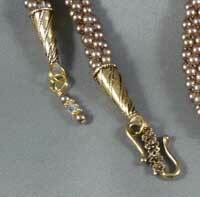 Pendants can also be worn on any gold or silver chain you might already have. They have a large enough bail to slide over most lobster claw clasps. Earrings can complete an entire set of jewelry or stand alone to complete your favorite outfit. I have included earrings to coordinate with bead crocheted necklaces and/or pendants as well as some “just for fun” earrings. I use hypo-allergenic ear wires (or Sterling Silver and tagged as such) on all earrings however surgical steel ear wires are available on any earrings at no additional cost. Shugies Victorian Reticules (handbags) are the perfect accessory whether you’re in elegant evening attire or a fancy wedding gown! Each unique reticule is handmade using a variety of silks, satins or brocade fabric and embellished with coordinating trims, beads and Swarovski crystals. Each bag is completely lined and has a drawstring closure/carrying strap.